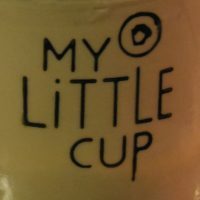 It seems unfair to call My Little Cup an international chain, but technically (by my definition, anyway) it is, with a branch in Brussels and this, the original, in Montréal. Although I’d been aware of My Little Cup from social media, it was actually a chance discovery on Saturday, my first day in Montréal. I’d gone down into Montréal’s underground city to see my friend off on the metro and there it was, a bright yellow La Marzocco Linea on a counter behind a security grill. However, what really caught my eye were the bags of Colonna Coffee lined up next to the espresso machine. This, I decided, was somewhere worth returning to! My Little Cup is a coffee counter, serving Calgary’s Phil & Sebastian on espresso and batch-brew, the options changing daily (batch-brew) and every two or three days (espresso). There’s also tea and a decent selection of cakes if you’re hungry, plus a small retail section, including coffee from Phil & Sebastian and occasional sample bags from roasters from all around the world. I’m not sure why, but I have a soft spot for coffee shops in railway and/or tube stations, so The Fifth Taste, which is in Ealing Common Tube Station on the District and Piccadilly Lines, has been on my radar since it opened in June last year. The only thing that has stopped me is that I don’t get out to Ealing much, but when I was doing my West London swing last month, I made sure to stop by. 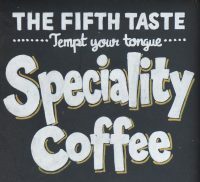 There’s not a lot to The Fifth Taste. It’s in the ticket office, tucked away to the left, much in the mould of Bica Coffee House at Westbourne Park or the sadly missed Piccadilly Grind at Piccadilly Circus. Serving a choice on espresso, plus batch-brew, all from old friends The Roasting Party, there’s also a selection of pastries. Unsurprisingly, it’s takeaway cups only, so don’t forget to bring your own. As anyone who travels by train in the UK knows, good coffee is hard to come by. 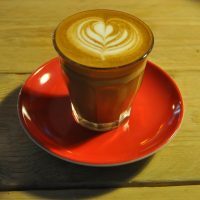 Every now and then, a coffee stand, such as The Flying Coffee Bean in my home town of Guildford, or Glasgow’s Luckie Beans, provides welcome relief, but a proper, sit-down speciality coffee shop is a rare find. This makes Canvas Coffee, located in the old station buffet on the concourse of Portsmouth and Southsea station, such a delight. Since opening in a small kiosk across the concourse in March 2014, Canvas has gone from strength-to-strength, moving into the vacant station buffet six months later and slowly growing to occupy the entire space. In many ways, it’s a typical station coffee shop, with commuters calling in for their morning coffee on the way to the train or office, while a steady stream of people and their luggage kill time before their trains. However, it’s more than that. With the Drake Blend from Winchester’s The Roasting Party served from a concise espresso-based menu, backed up with a range of options for lunch, plus cake throughout the day, it’s a destination in its own right, a large, spacious coffee shop that would grace any city. 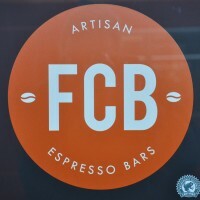 The spot around the back of King’s Cross station has a long and distinguished history when it comes to coffee stands, having housed both Weanie Beans and Bean & Gone (both before the Coffee Spot’s time) and, most recently, Noble Espresso. However, in November 2016, Shaun, the man behind Noble, made the hard decided to give up the coffee stand to concentrate on his booming milk business, Estate Dairies. What could have been a huge loss to all concerned, not least his band of loyal customers, was averted by some forward-thinking by Shaun who invited Craft Coffee, veterans of the outdoor coffee scene with a long-standing weekend pitch at Maltby Market, to take over. Emily and Jamie, Craft’s owners, said yes, so now you’ll find them here during the week, turning out fine espresso-based drinks using an exclusive single-origin from Notes, plus tea, hot chocolate and a selection of pastries. When it comes to railways, I have a romantic streak a mile wide. However, railway coffee and station coffee shops, with the notable exception of the likes of Coffee Affair, can sometimes be disappointing. Step forward Porter, a relatively new addition to Madison’s speciality coffee scene, located in the city’s old railway station. The (passenger) trains may have long gone, but Porter has recreated the atmosphere quite nicely, especially outside, where you can sit on the old platform. Serving Counter Culture from North Carolina, Porter has the Hologram espresso blend, plus different single-origins on guest espresso, pour-over, bulk-brew (drip) and on tap (cold brew). 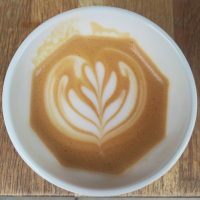 The coffee menu comes in two parts, a more mass-market-based left-hand side with lattes and drip coffee offered in sizes of 8/12/16oz, and a more speciality-orientated right-hand side with cortados and flat whites. Porter also offers a range of made-to-order and pre-made sandwiches, plus other breakfast and lunch options. There’s the usual selection of beans and coffee equipment for sale, but, unusually, they’re joined by items you’re more like to find in a delicatessen or grocers: tinned tomatoes, sardines, cured meats, cheese and a select range of spirits were just some of the things I noticed. When I ran into Jamie, owner of Luckie Beans, at the Glasgow Coffee Festival, I learnt all about the coffee cart which had opened, at rather short notice, the previous summer. Invited in by the management at Glasgow Queen Street Station, Jamie had all of two weeks to set everything up, including sourcing the cart and all the equipment. The result is quite impressive and a welcome addition to the station. Although there are plenty of options nearby in Glasgow city centre, there’s nothing quite like having speciality coffee on the station concourse, especially if you’re waiting for a train. 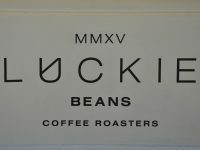 The Luckie Beans cart serves a blend and single-origin on espresso, with the option to buy the beans. There are also various sweet treats and savoury offerings, including porridge and sandwiches. If that wasn’t enough, there’s also a small seating area, perfect if you have a few minutes to spare. What’s going on? For the third Coffee Spot in a row, I’m visiting places in the order in which they opened! Hot on the heels of the original Artisan in Putney and the first Society Café on Bath’s Kingsmead Square, comes Doctor Espresso – Mama V’s in Clapham High Street! I visited the original Doctor Espresso, Doctor Espresso Caffetteria, opposite Putney Bridge tube station, in the summer of 2013, not long after it had opened. So it seemed fitting that I should pop into Doctor Espresso’s second venture, named Mama V’s (after Vanessa, co-owner of Doctor Espresso) a couple of months after it had opened. Following the precedent set by the Caffetteria, Mama V’s is also right by a station, this time the overground, where it is nestled in an arch under the line by Clapham High Street station. Mama V’s serves the same basic menu as the Caffetteria: coffee, cake and some lovely Italian food (panini, calzone, pizza, pasta & salad). If ever a place was designed to appeal to me, it’s Doctor Espresso’s. Pride of place, of course, goes to a classic 1957 Gaggia Tipo America lever espresso machine, just one year younger than the one in the Caffetteria! The Flying Coffee Bean is a chain of coffee kiosks on stations in the South East. The Guildford one’s been a fixture for several years, but, until recently, I never gave it a second thought. 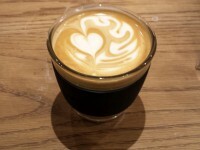 I distinctly remember when, a couple of years before I started the Coffee Spot, I took my coffee (a two-shot latte) back to get an extra shot because all I could taste was milk. The barista didn’t look best pleased, explaining that this was how the customers liked it, at which point I decided to take my custom elsewhere. Fast forward to six months ago and, for various reasons, I revisited the Flying Coffee Bean. Expecting disappointment, I was pleasantly surprised. 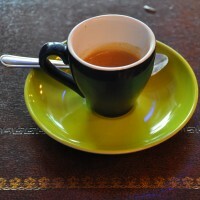 Not only could I taste the coffee, it was really nice-tasting coffee too! 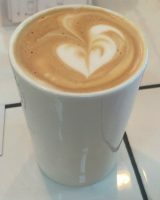 12-second extractions were a thing of the past and the milk was steamed so it held decent latte-art.